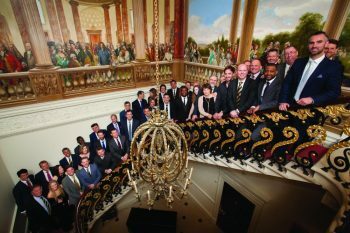 In the Lent Term, a dinner was hosted at The Ritz Hotel London to celebrate 25 years of sporting excellence, overseen by the Headmaster, Dr Barnett, who is due to retire in the summer of 2017 after 26 years at the helm. A special book was launched at the event, in honour of the last two and half decades of amazing sporting achievements and evolution of sport at Whitgift. Members of the Sports Department, past and present, gathered along with an array of Old Whitgiftians, including Danny Cipriani, Marland Yarde, Joseph Choong, Laurie Evans, Jonty Griffiths, Troy Brown and Adam Thompstone. Sporting alumni and past members of staff travelled from all over the country – with some even coming from the USA and South Africa. It was a momentous occasion to have so many significant people from the Whitgift sporting family together in one room. The Headmaster had composed a touching grace in honour of the evening. Interspersed between courses, Mr Beck led an amusing Question and Answer session, with Laurie Evans, JB Gill and Danny Cipriani gamely taking part. Dr Barnett concluded the evening with a poignant address, expressing his gratitude to the Sports Department and his pride in the path that Whitgift has helped the sportsmen achieve.